Reading already? Well, not really. But she puts on a good show. One of the popular books at Mara’s daycare is “Brown Bear, Brown Bear, What Do You See?” Mara has heard it so much and the wording is simple enough that she actually can recite the whole book. She showed off this skill at the beach and we taped it to play for everyone. The fact that she rarely looks at the book is a dead give away that she is not reading it. She needs to practice her faking more. Preston tries to get in on the act too. We have been trying to get Mara acclimated to the pool this summer and teaching her little by little techniques to use to swim. 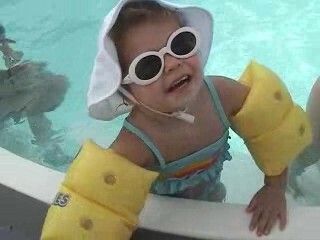 You might remember that we had so far only used a life jacket like float in order to get her “swimming” by herself. A few weeks ago on the visit to Richmond we got the use of some borrowed swimmies from Grace’s cousin. Mara has her own pair, but I think Dad was thinking she might be too small or young for them. Nope, they fit her fine and she was OK for that round. They actually balanced her better than the other float. Well this past week at the Outer Banks she took it upon herself to swim by herself using the swimmies. It got to the point that she was telling Mom to not touch her. Before we left for the beach she was a pink frog, since she liked to jump everywhere while on land. Now she was telling us she was a pink fish. Take a look at the video and see a guest appearance by Campbell and Preston.